The Speed and Strength SS1600 full face motorcycle helmet comes lined with a removable and washable Cool-Core moisture wicking liner and is built with an A.T.P.A. Advanced Thermo-Poly Alloy shell that meets or exceeds DOT. 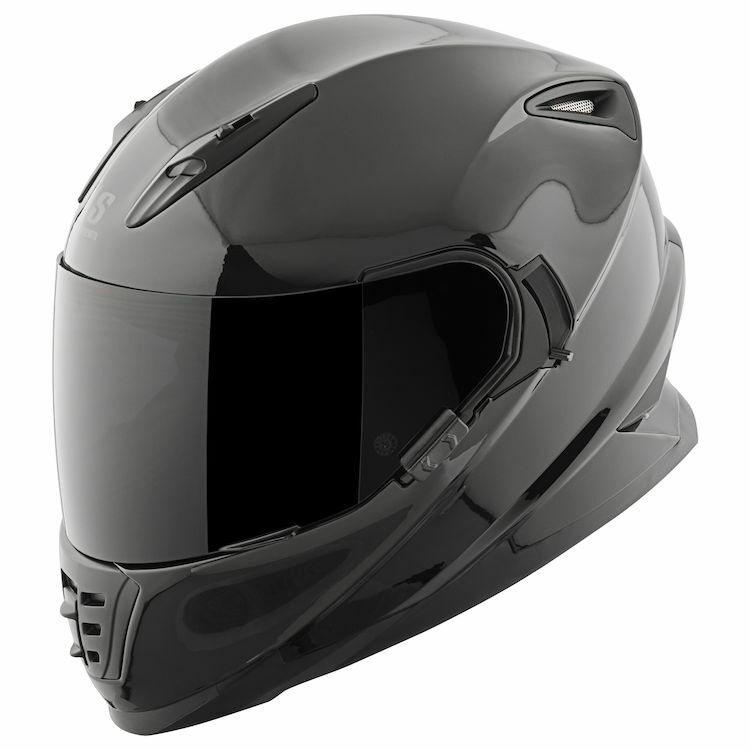 The 1550 gram motorcycle helmet contains a Lockdown shield security system and an Air Strike direct course ventilation system providing proper airflow circulation. A DVD Drop Visor Design is included for sun protection and an All Clear! optically correct, anti-scratch, anti-fog and UV resistant clear face shield. I absolutely love the style of this helmet. I was looking for this exact look as other manufacturers didn't come close to this design. With the DVD system incorporated into the hemet, it's extremely helpful. Great helmet for the price. Comfortable, great visibility, looks awesome. This is a great, comfortable, sleek helmet. I get compliments on it from time to time. It's a touch on the heavy side, but that doesn't bother me. The latch for the visor lock doesn't work well but I don't see a need for it really. Otherwise I love this helmet. I love this helmet! Very comfortable. I ordered a large as I generally fit a medium. Little bit of noise when riding. Warms up easy in the helmet, could have a little better ventilation. I got gloss black as matte finish is harder to clean. Looks great with all visor colors. Drop down visor works great sits right above breath guard nose piece. This is a great helmet for the price. Rode hard and fast to a rally to break it in. The wind was not a problem at all inside this helmet. I am a true fan and will switch over from icon. Helmet isn't heavy, I love the DVD feature, Airflow was very good, and noise was limited for this price range helmet. At speed, looking directly forward, no wind noise, and only minimal wind noise when turning my head. I'd definitely buy again. I bought this helmet because of its looks and internal sunvisor. I had a large HJC CL-17 and Bell Revolver and bought it in a large as well. The fit around the cheek pads were tight at first but once broken in, it was comfortable. I love that the shell size was a lot smaller and narrower than my other helmets. I found that the internal visor did not operate as smooth as a liked and it took some getting used to reaching for the drop down lever. This helmet does not flow air well at all. In my HJC, I could feel a rush of air on top of my head but not in this one. There are no air flow groves inside the helmet foam. The foam is pieced together as well. It was not one uniform piece. Were the top and sides meet was not a gradual curve but more of an abrupt angle. Get this is what you get at this price point. I have been riding in this for the past four months now and I will get a true test of this helmet once summer hits. Stylish and sleek helmet with great features for a great price. The DVD system is awesome for my ride into work and clear visor for coming home at night! All around great helmet and Revzilla nailed it on the sizing for this bad boy! Interested in the DVD feature, and excellent price point. Great helmet with versatility! I learned to ride in this helmet and it looks great with my CBR650F. It is very comfortable......after it breaks in of course, but I would recommend it to all my friends and riding family. I wanted a good and stylish helmet with sun visor under 200$ with minimalistic style and one color - this was exactly what I was looking for. I liked the overall look of the helmet, I decided to go with the matte black. One big component to me choosing this helmet over the SS1310 was the DVD (drop down visor) feature. I think that's a big plus!!! the look had me sold from the moment I clicked on the link! I started looking into it more and more and knew it was right for me, its priced perfectly and I feel like it would protect my head in any kind of crash. Must have for the full SS black look. Hi, I got a 60 centimeters "square" head shape, would like to know dose 2xl size good for me? BEST ANSWER: Search "ss1600 face shield" on revzilla and select which one you want. There's smoked, clear, and the Golden reflective one. is this helmet compatible for scala rider headset ? What's the difference between the ss1310 and the ss1600? Does the drop down sun visor come close enough to prohibit the use of glasses? BEST ANSWER: I have no issues wearing my prescription glasses with this helmet. The sun visor does not hit my glasses and there is enough room in the padding to slide them in comfortably. Yes the drop down sun visor comes down and covers the eyes. With the breath guard in it drops to the top of that around the nose so glasses shouldn't be needed. 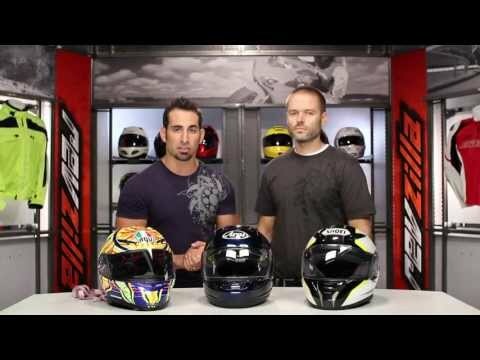 Does the black one come with a tinted outer visor like the picture or is it clear? BEST ANSWER: Mine came with a clear visor...bought the tinted separately but it's worth it 100%. Mine came with a clear outer visor and a tinted inner one. Clear. You have to order the tinted outter visor. Is it ear bud friendly? And or can you put speakers in it? BEST ANSWER: Depending on your fitment, they might feel a little tight. I wear mine all the time though. Does this helmet have the air pump interior for better fit? Is this helmet compatible with a headset? BEST ANSWER: My Sena 10c pro works perfectly with my helmet. Is the face shield interchangeable? BEST ANSWER: Yes it is. They have silver, clear, and tinted for around $30 each.